I'm in the process of creating a spreadsheet that will suggest optimal teams based on selected leader and game mode (ie. Arena, Raid [and phase], Events, etc.). I'm looking for as many people to mess around with it and suggest changes or improvements, so don't hold back your comments. If this looks even remotely interesting or useful (even if only to beginners), please give me an upvote so that more people can be exposed and have a look. Here is a link to the spreadsheet. Here is a link to my Discord server if you'd like to follow the sheet's progress or become a contributor. We've made a lot of updates to the sheet. Check it out! Thanks for bothering and thanks for sharing. I've added a lot of features to this spreadsheet. There is now a side by side comparison for multiple squads; useful for Territory Wars and Grand Arena. Pulls player's "real-time" stats for accurate comparison. Several "pre-loaded" teams for all modes of the game. 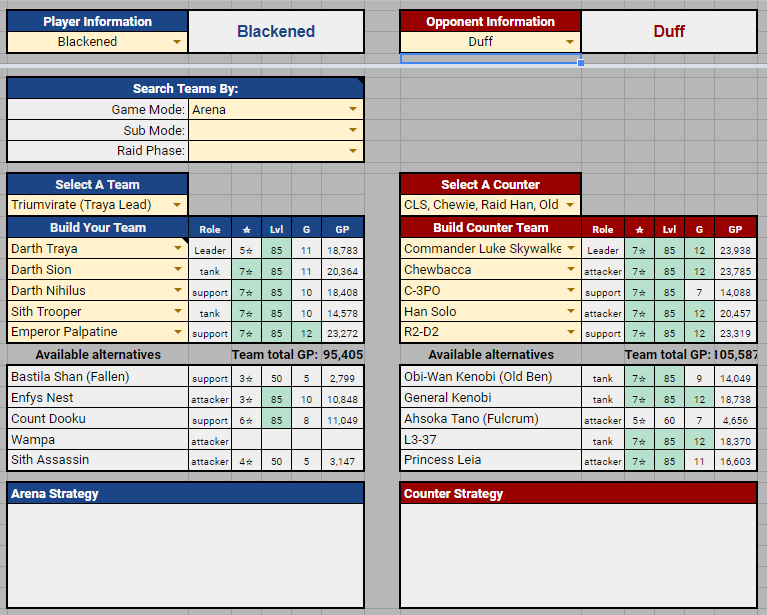 Also displays strategy with each team/game mode. Several more updates coming soon!